1 cup milk mix with 2 tbsp lemon juice and mix. Then let it stand out for about 10 minutes. Then mix well and your buttermilk is ready.. In a mixer, whisk together, eggs, sugar, salt, yeast and baking powder. Mix these together until light and somewhat fluffy. Then add oil and continue mixing. Next add half of the flour and mix. Then add the buttermilk, water, milk and continue mixing. Now add the remaining flour, vanilla sugar and mix well. Let the batter rest and puff up. 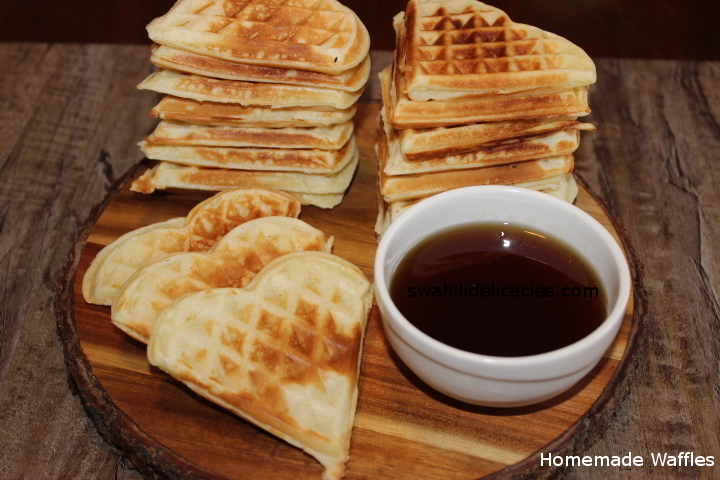 Once puffed up, cook the waffles in a waffle maker. When ready, serve them with syrup, butter or even plain.